What are the hours of the Stockyards? Stockyards Station stores are open 10 a.m. to 7 p.m. Most restaurants are open 11 a.m. to 10 p.m. 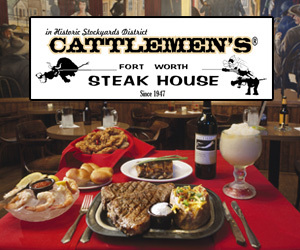 Most Stockyards saloons are open until 2 a.m. on the weekend. How do you get here from downtown? Trains, buses and parking are available to help you get here. Learn more in the Get Here section. Do you have taxi service? You can call a Yellow Cab from the Visitors Center or hail one at Billy Bob’s Texas during the evening: 817-534-5555. Where can I park a semi truck, an RV or a horse trailer? Horse trailers, trucks and RVs can park at Stockyards Stables RV Park. There is limited overnight RV parking but no hookups at Billy Bob’s Texas. When is the rodeo and where can I buy tickets? The rodeo is every Friday and Saturday night at 8 p.m. Buy tickets. What time and where is the cattle drive? The cattle drives are every day at 11:30 a.m. and 4 p.m., weather permitting. The best place to watch is in front of the Livestock Exchange Building at 131 East Exchange Avenue. Follow the Fort Worth Herd on social media for all updates on scheduling. I am planning a vacation. Do you offer packages? 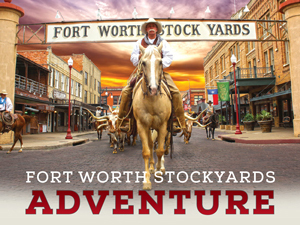 Yes, one of our most popular packages is the Stockyards Adventure Pass. 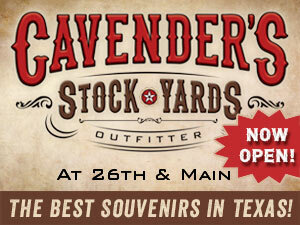 Contact the Stockyards Visitors Center at 817-624-4741 for more information on this package and others. Can you please mail me brochures? Fort Worth downtown at 817-336-8791. We are sorry but wheelchairs are NOT available for rent. Lost and found is at the Stockyards Station Counter inside the Visitors Center, open daily from 9 a.m. to 5 p.m. at La Plaza Building, 2501 Rodeo Plaza, 817-625-9715. Can I walk around the Stockyards with a beer? Yes, in the Historic District you are able to walk the sidewalks with a beer if it is purchased from a venue on Exchange Avenue. I have a product to sell. Who can I contact? Contact each business directly for more information on selling products or services. This is not an information line to a broad range of businesses. Do you allow vendors in the Stockyards? Contact Paulina Macias at 817-625-9715 or pmacias@stockyardsstation.com for information about Fort Worth Business Association-hosted events. Who do I contact to take professional photos on your property? If you’re using props or a backdrop, this constitutes a “professional photo shoot,” and you’ll need to acquire permission from each of the individual businesses where you’ll be shooting. 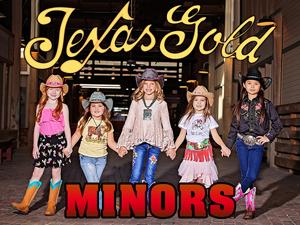 To shoot at Stockyards Station, contact Paulina Macias at 817-625-9715 or pmacias@stockyardsstation.com. To shoot the Fort Worth Herd cattle and drovers, contact Kristin Jaworski at kristinjaworski@fortworth.com. To shoot at other businesses, please contact their Marketing Director. Who is the media contact for the Stockyards? For media inquires, contact Jessica Christopherson at the Fort Worth CVB at 817-698-7842 or jessicachristopherson@fortworth.com. How do I advertise or list my business on FortWorthStockyards.org? Contact info@fortworthstockyards.org for more advertising and promotional information. How can I rent booth space at a special event? How can I book my band to play at the Stockyards? If you’re interested in playing in a bar, you’ll need to contact the local bars individually. You can also contact Hear Fort Worth, a resource for anyone who cares about live music in Fort Worth – whether your interest is industry networking, education, music tourism or growing your small business. There are public restrooms inside Stockyards Station, the Livestock Exchange Building (during business hours), and the Visitors Center (during business hours). Horses are allowed on public streets, following the flow of traffic, but not on pedestrian walkways (sidewalks, inside Stockyards Station or on the grass). See a list of kid-friendly activities. How can I book a Stockyards venue for a wedding, reception, rehearsal or reunion? There is bus parking on the east side of Stockyards Station in lot 914. Learn more. How do I contact the Film Commission for Fort Worth? To contact the Fort Worth Film Commission, please contact Jessica Christopherson at Visit Fort Worth at 817-698-7842 or jessicachristopherson@fortworth.com.